The French government is unhappy about large executive pay packages at French automakers. The French government is saying "non" to multi-million dollar pay packages for the country's leading auto executives. France's finance minister Michel Sapin said this week on French radio that his government is voting against large pay packages for the chief executives of automakers Peugeot and Renault. He called the pay "damaging." The French government has a sizable stake in each company as a result of bailouts during the financial crisis era, which gives it voting rights in these matters. 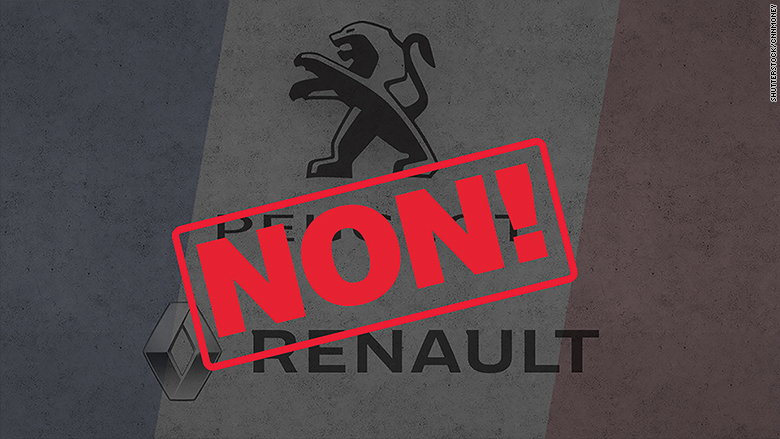 However, the government's 13.7% stake in Peugeot and 19.7% stake in Renault won't be enough to force the car companies to change the pay unless other voting shareholders also join the government's crusade. Renault's chairman and CEO Carlos Ghosn received a total of €10.7 million ($12.2 million) in cash and stock in 2015, up from 2014 and more than double his pay package from 2013. He's also received millions in compensation as head of Japan's Nissan Motor Company, which is partially owned by Renault. Peugeot's chairman Carlos Tavares received over €5.2 million ($5.9 million) last year in cash and shares, though his base pay of €1.3 million has remained the same since 2009. The company is proposing to raise his variable pay in 2016, provided he meets his corporate targets. Peugeot told CNNMoney that the government is recommending all partially state-owned companies decrease their CEO pay by 30%. The government would not elaborate further on their expectations for pay. Shareholders will vote on the issues in late April at the companies' annual meetings. Peugeot sold 3 million cars last year, mostly to European customers. Renault delivered 2.8 million cars last year, with France being the company's #1 market by a long shot. --CNN's Noisette Martel and Aurore Gayte in Paris contributed to this report.